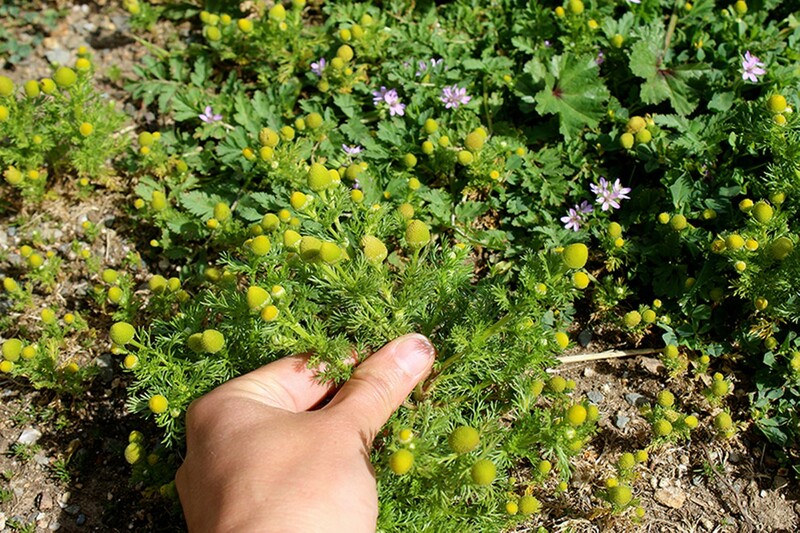 Edible plants in the East Bay include pineapple weed (wild chamomile). Kristen Rasmussen is a registered dietician, a UC Berkeley lecturer, and a forager. Currently, she's working with professor Philip Stark on Berkeley Open Source Food, a project that aims to promote weeds as an alternative source of healthy, cheap (i.e. free) food in the East Bay's food deserts. "It's just amazing how you can find edible weeds everywhere," she said. In addition to her team's research, Berkeley Open Source Food has opened its study to the public. 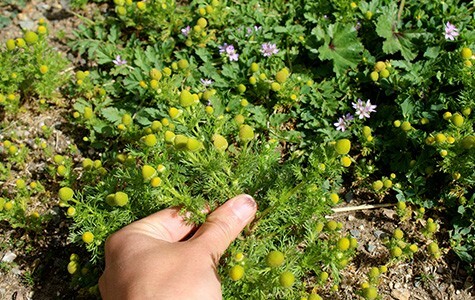 Using the iNaturalist app, East Bay foragers can snap pictures of the edible plants they find — such as, pineapple weed (wild chamomile) growing in sidewalk cracks and wild radish poking through chain link fences — and share the plants' locations and scientific fames with fellow foragers. "When people think foraging, they think mushrooms, which can be very intimidating," said Rasmussen, referring to the fact that some mushroom species are poisonous. But foraging isn't something that only happens in woodland forests with experienced gatherers — the abundance of edible plants in the urban East Bay means that all you have to do to start foraging is take a walk in your neighborhood. "The best way to start is just to focus on one thing, maybe dandelion, which is really common. So maybe you gather and cook dandelion for a week. And then the next week you try nasturtiums," Rasmussen said. "The biggest problem is that people get overwhelmed. Go slowly and have fun." There's no need to memorize every edible weed of the East Bay before you go out. It's better to be sure the plant you're picking is actually edible. "Never try to make a plant fit its description," Rasmussen said. "If you're not sure, leave it." Another thing to keep in mind? Pesticides. Just like the food you buy at the supermarket, foraged plants should be washed before eating. One of the biggest stigmas facing foraging is the idea that urban-foraged plants are unclean. "The other day we were collecting samples and this guy came over and was really interested in what we were doing, but when we asked if he wanted to try some he said, 'I'll pass,'" Rasmussen laughed. Edible plants, which are often invasive species, are sometimes sprayed with pesticides or ripped out and composted, when they could be eaten. Weeds are also often very drought-resistant. Members of Berkeley Open Source Food advocate for legislation that would replace the use of pesticides on weeds with legal foraging. "Right now, the only legal way to forage is in your backyard. ... But I've never heard of anyone getting in trouble for foraging." The group is also encouraging chefs at Chez Panisse and Mission Chinese to use weeds in "wild" menus. "Not everyone can go to these fancy restaurants, but once you see chefs using these plants, they become special," said Rasmussen. At home, Rasmussen enjoys her foraged goodies in salads. "A lot of these you can use as you would any green. Some of them are quite bitter, so a vinaigrette helps." Her blog, Rooted Food, is full of foraged recipes, ranging from rosemary cocktails to dandelion green pesto. In the summer, Rasmussen, who searches for wild plants when she goes camping, looks forward to elderflower, green walnuts (which she pickles), and bay nuts (a California native that tastes like a cross between coffee and chocolate). The exciting thing about foraging in the East Bay is that there's an abundance of both urban foraging opportunities and natural spaces in which to look for edible plants. A hike through Berkeley's fire trails, Sibley Volcanic Regional Preserve, or Tilden Park — which Rasmussen calls "very lush" — will yield plenty of foraged finds. In the summer, look for wild blackberries and strawberries — the pretty white flowers popping up in early summer will turn into ripe berries by August. Himalayan blackberries are an invasive species that you can find all over the East Bay: Just pick any hiking trail and look for the white flowers or dark fruit. Nasturtiums, which Mia Andler and Kevin Feinstein, authors of The Bay Area Forager (which Rasmussen recommends for beginners), say "should be [San Francisco's] icon for wild edible plants," are pretty orange, red, and yellow flowers with big flat green leaves that look like lily-pads. Once you recognize them, you'll see them all over. Pluck a few and add them to your salad for color and a mild, pepper-y flavor. Rasmussen said that finding edible plants like nasturtium "becomes like going to the grocery store — you're not going to confuse broccoli with spinach or spinach with kale. Once you start recognizing the plants, it becomes easy." But how do you start recognizing them? ForageSF leads "wild food walks" in East Bay parks for $40. You can also learn to identify plants on your own, with resources such as The Bay Area Forager; Berkeley Open Food Source's website Forage.Berkeley.edu; and The Bay Area Baker's Dozen Wild Edibles, a pamphlet available with $15 donation to Berkeley Open Source Food.